The UK’s leading surface repair and restoration service. Magicman® needed their customers to be able to submit damage enquiries easily and for their team to better manage the follow-up estimates efficiently and securely. Google Analytics web analytics service revealed ever increasing traffic from mobile devices with an unusually high proportion using Apple iOS products. 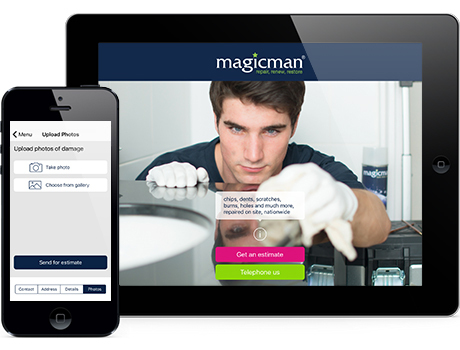 To better serve customers and to future-proof the business, a Magicman® App became a necessity. Customers found it easier to use than a website and just by having an App, potential partner companies recognised Magicman® as a serious player in the marketplace. Are eplatforms mind readers? When I go to them with a new idea, I usually find they have thought of it first and already have something in development they can show. 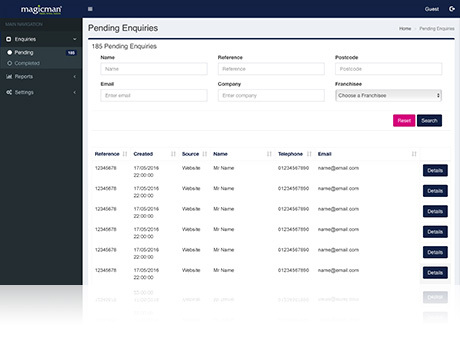 So that staff could better control enquiries and review damage, we assigned a unique reference to all enquiries with easy tracking capabilities. The handling agent is noted along with the ability for internal notes and customer follow-up to be carried out. Magicman® is the UK's premier damage repair and restoration service. Established in 1993, they are trusted by insurance giants RSA, LV=, Direct Line, major construction firms, hospitals, hotels and cruise line companies from here to the Bahamas. They repair chips, dents, scratches, burns, holes, splits, scuffs and stains to almost any hard surface in your home or work place nationwide and even internationally.